* Florida was fabulous. The kids are amazing little people — getting more grown up by the minute — and my sister and BIL are doing a great job with them. Mrs. Crappy and I got to the beach four of the six days we were there. I ran a 10K and didn’t die. And we properly celebrated Crappydad’s upcoming 75th birthday. * And then we had to come home to snow flurries. Really? * While we were in Florida, I neglected to wrap up the Seventh Annual Uncle Crappy NCAA Final Four Challenge (Brought To You By Bocktown). Because of unusual circumstances that require consultation with our sponsor, I will do so on Monday. * The 10K was difficult, but fun. I was too slow — finished at 1:20 — but I completed the race knowing what I needed to focus on as I get ready for the Pittsburgh Half. And then my groin decided that there would be no running of any consequence this week, and I’m left with three weeks to prepare to run 13 miles. I am not happy about this. I’ve joked a bunch about not letting my various attempts at running kill me — see above, for example — but the half — especially if it’s a warm morning — actually could be a dangerous thing, given my lack of training in the last couple weeks. * If I’m able to run it at all. * For as excited as I was about the start of the hockey playoffs, the actual games have been nothing short of a horror. I’m less concerned with the fights and cheap shots on both sides — they happen, although usually not this much in the playoffs — than I am with Penguins’ horrible defensive effort. Or lack thereof. The team is staying positive — Bylsma said after Sunday’s game that Fleury would start the remaining four games of the series — and I will as well. * I’ll do that for a couple of reasons. First: Mrs. Crappy and I want to watch Friday’s game at the big screen outside CEC. Can’t do that if the series ends Wednesday night. 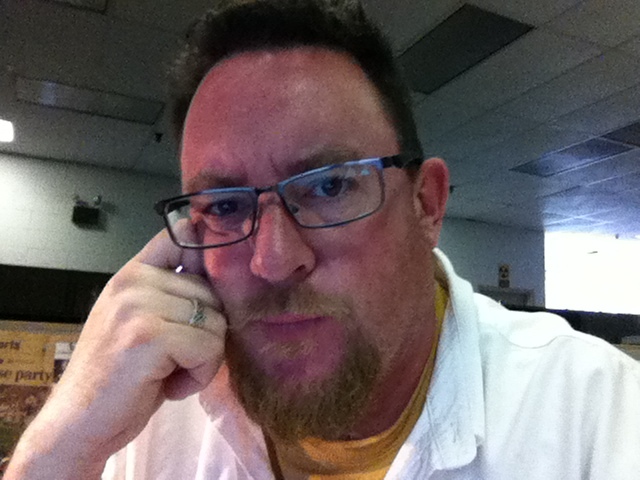 * Second: I need to give my playoff beard a little more time. I may watch this every morning until the Stanley Cup Playoffs are done. I’ve been in Pittsburgh for a bunch of Penguins’ playoff runs, but Mrs. Crappy and I had never made it into town to watch a game on the Big Screen. Sort of independently of each other, we both thought Friday would be the right time to give it a try. 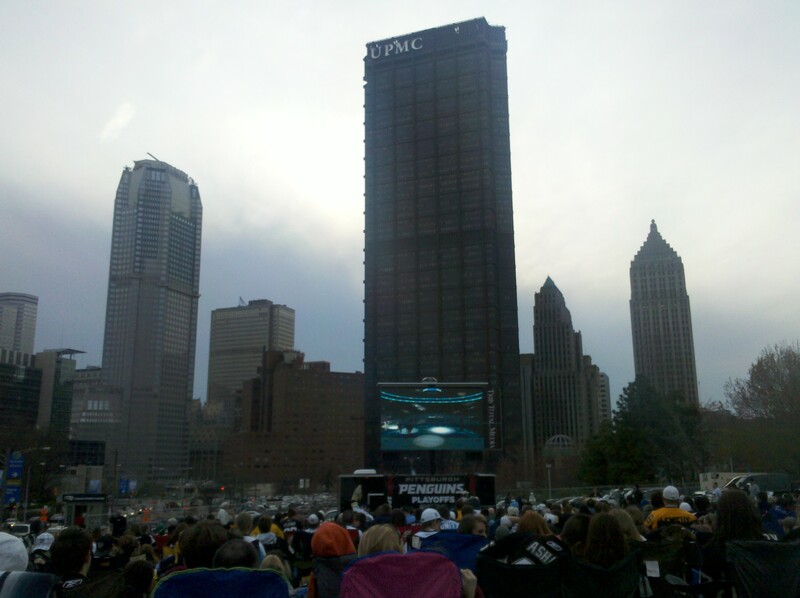 For the uninitiated: For years, the Penguins have set up an enormous TV outside the Civic Arena so those not fortunate enough to have tickets to the game inside could still watch in a something pretty close to a game atmosphere*. I have friends who have watched games at the screen for a long time, and all swear by the experience, but we’d just never got around to it. Because I was the only one not working on Friday, I loaded a cooler with sammiches, snacks and Fresca — they’re pretty tough about the drinking in the lot — and set up early a pretty good distance from the screen. Mrs. Crappy and a bunch of other friends arrived with the rest of the crowd; the empty spaces around our chairs filled in pretty quickly. We had an awesome time. We didn’t see a lot of great hockey — the Pens managed playoff intensity for about 10 minutes in the second period — but watching Mikey and Bob work the crowd before the game and sitting with a few thousand close friends on a breezy night made it worth it nonetheless. And yeah, when the Pens scored their only goal of the night, we got a reaction pretty close to the one in Crew Stadium. Mrs. Crappy made some grumpy pronouncements after the game about not being able to go back because of the loss, but if I had to guess, I’d say we’ll be back. *Unless NBC is showing the game. Dicks. Earlier today, we talked about how I’m planning on starting New Year’s Day. What I’m having some trouble with is what happens later. The last two years, we’ve come home from the post-swim mean and parked on the couch. There is food, sure, but the big deal? January 1 is college football’s holy day and I like to make sure I don’t miss a thing. 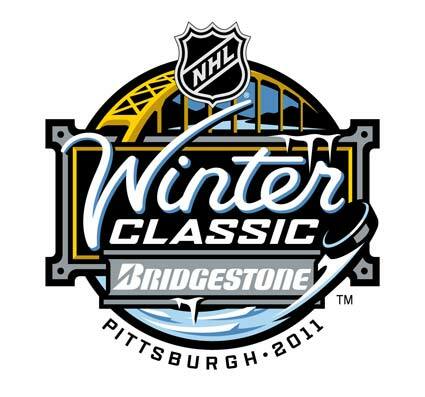 The NHL threw me curve ball a few years ago, when it started the Winter Classic games. The year the Penguins played in Buffalo, I watched the game, even though missing the bowl games that were on at the same time made me a little twitchy. I’ve watched bits and pieces of subsequent Classics, but if I’m being honest, I’ve paid more attention to the football. Last year, that plan served me well; watching Penn State’s mud bowl win against LSU, the insane game between Auburn and Northwestern — and yeah, that Rose Bowl game was pretty important to me as well. In 2011, of course, I have another Penguins game to contend with. There’s no conflict with Ohio State, fortunately — the Sugar Bowl against Hooo Pig Soooey isn’t until Jan. 4. But I’m already getting pretty pumped about the Pens and Caps. And that’s kind of a problem. I have strict rules about this stuff. I don’t allow a whole lot of distractions during football season, which runs from early August — when Ohio State’s camp begins — through the bowl game. I’m not a raving, superstitious lunatic, but I don’t like mixing mojo when it comes to sports — I think it tends to dilute whatever I have to offer, to either team. But I can’t help it. I’ve been watching the first episode of the HBO 24/7 series over and over and over. I find myself reaching for Pens gear when I’m getting dressed on weekends or when I get home from work. I’ve been looking at those Winter Classic jerseys and thinking that I might need one of those. For me, this is wrong. For me, hockey season starts the minute the final gun sounds at the Buckeyes’ bowl game — and not before. I’m a mess already, and it’s probably likely that I’m going to be a babbling wreck by the time the game rolls around.